In the earlier examples, we were given one of the legs of a 45-45-90 triangle. What if you're given the hypotenuse instead and you have to find the legs? No problem, you just need to go backwards. When you know the leg of a 45-45-90 triangle, you multiply it by the square root of 2. How do you undo multiplication? You divide. If you know the hypotenuse, you can just divide it by the square root of 2 to find the leg. Once you have one leg figured out, the second leg will be the same. Don't get thrown off by the way the picture has been drawn. The legs of a right triangle always form the letter "L" - they make the 90 degree corner. In this triangle, the legs are f and g. The hypotenuse is always across from the right angle - the 10 is the hypotenuse. In a 45-45-90 triangle, you can divide the hypotenuse by the square root of 2 to find the leg. Once you know one leg, you know the other because both legs always have the same length. Your teacher may have you just leave the answer this way. 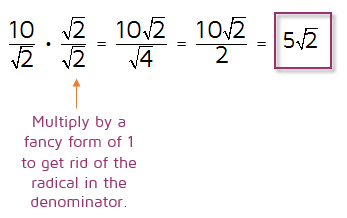 Technically, the answer is not simplified because it has a radical in the denominator of the fraction. If you're asked to simplify the answer, you can multiply the numerator and denominator by the square root of 2. When you do this, you end up with a perfect square under the radical that can be simplified.